It looks more and more like Aaron Rodgers will sit once again while Matt Flynn starts at quarterback. GREEN BAY, Wis. — Mike McCarthy is ready to put Aaron Rodgers on the field. The Green Bay Packers as an organization, however, seem to disagree. At least right now. The Rodgers injury saga added yet another chapter Thursday, one that appears to be heading toward a conclusion of the former NFL MVP quarterback not being medically cleared before Sunday’s game against the Pittsburgh Steelers. "(Rodgers) looked very good at practice," coach McCarthy said. "I would state him ready to play." "He looks sharp," McCarthy added. "He definitely looks better this week. He looks like he’s ready to play." With those proclamations, though, McCarthy also added that backup quarterback Matt Flynn "took the majority of reps" in Thursday’s practice. 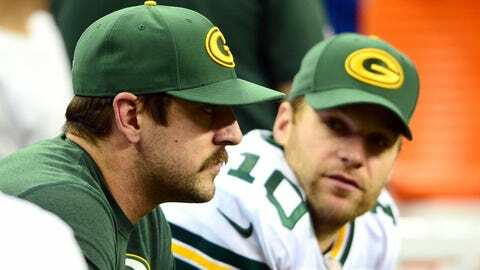 That is as sure a sign as any that it will be Flynn, not Rodgers, who will get the start this weekend. "(I) didn’t take a lot of reps with the teams but felt pretty good out there, was feeling good," Rodgers said at his locker Thursday. "It’s obviously a medical decision and an organizational decision at this point." Rodgers’ frustration was evident. Normally quite talkative and open with reporters, Rodgers answered 13 questions in a less-than-three-minute interview before the team’s public relations staff ended the media session. Three of Rodgers’ 13 responses were simply "that’s a question for Coach McCarthy" or "that’s a Mike McCarthy question." Rodgers wouldn’t discuss who within the organization was holding him back from playing. However, it’s clearly not Rodgers himself and it’s not McCarthy. Logically, the final word would need to come from Ted Thompson, whose titles include executive vice president, general manager and director of football operations, as well as team physician Dr. Pat McKenzie. Rodgers had a medical scan done Dec. 12, but he wouldn’t reveal whether any more are scheduled. "It’s tough to be so close last week and not to be able to play," Rodgers said. "But we’re right in this thing, Matt’s playing well and I’m back on the practice field, so the frustration level has gone down." Rodgers, who is 45 days removed from breaking his left collarbone, continues to be listed as a limited practice participant. "I have a good sense of what’s going to happen, yes," Rodgers said when asked about the possibility of playing Sunday before reverting back to his "it’s a medical decision, it’s an organizational decision" response when asked specifically what that sense was. When McCarthy was asked if he’s of the opinion that he thinks Rodgers should play, he said, "No, you wanted an update. I mean, you wanted to know how he looks, he looks good. He’s a limited practice participant. He hasn’t been medically cleared." The official announcement from the Packers on Rodgers’ status will come Friday, but most indications are that Green Bay will need to play at least one more week without him.